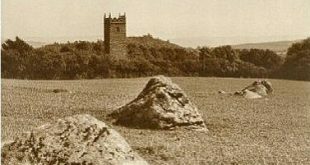 There were many medieval manors on Dartmoor and Rushford is one of those timeless places where it seems time has stood still, although most of the original structures have long gone there are still vestiges that appear to last throughout time. You can literally walk in the foot steps, or at least stepping stones that for centuries travellers have passed across as they went about their daily lives. “Eadwig holds Rushford from Baldwin, He himself held it TRE (Tempore Regis Edwardi – in the time of King Edward or before the 1066 invasion) and it paid geld for 1 hide. There is land for 5 ploughs. In demesne is 1 plough, with 1 slave; and 8 villans and 5 bordars with 3 ploughs. There are 5 acres of meadow, and 4 acres of pasture and 4 acres of scrubland, Formerly, as now worth 30s”. The manor of Rushford certainly appears on Benjamin Donn’s map of 1765 although it is only the mill that is marked. 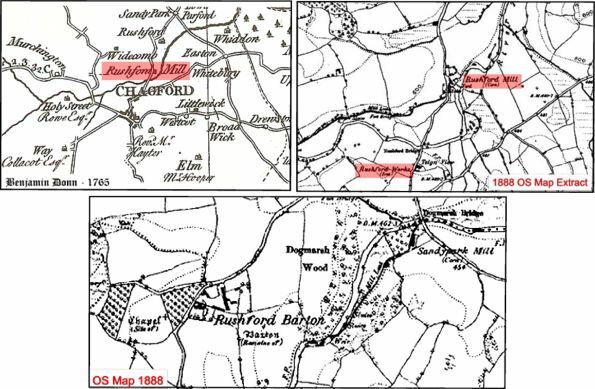 The OS map of 1888 shows the barton, mill and outlying farms as separate identities – see maps above. The manor of Rushford belonged to a family called de Risford until around the late 1100’s when the heiress married a man named Hore. There is a record dating to 1249 in which a John Furland complained to the justices that the lord of Rushford had deprived him of his grazing on the fields after harvest, this presentment was upheld on the lord had to restore seisin (the possession of such an estate in land as was anciently thought worthy to be held by a free man) and pay compensation, Finberg, 1952, p. 271. During the period between 1300 and 1400 a family called Monke held the manor from the Hore’s. who returned by Tudor times. It was the Hore family who probably built the Tudor Barton of Rushford which was located just to the north of the old Norman manor house. The building was said to have been described as a “fine Tudor barton”. In 1856 the whole estate of Rushford was brought by the then rector of Chagford George Hayter Hames, this included Rushford Barton, Rushford Mill, and Rushford Wood. The original farmhouse was destroyed by a fire in 1913 and was then virtually rebuilt. 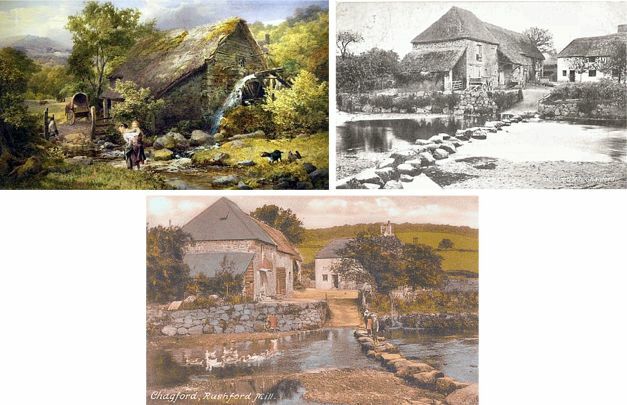 Rushford Mill was the original manorial corn mill and it is thought that the stepping stones which spanned the river Teign were at one time the main crossing point from the manor to Chagford. It was normal for each manor to have its own grinding mill and then everybody who was affiliated to that manor were compelled to bring their corn for grinding be it for flour or grist (cattle feed), Harris, 1992, p.118. In many places the miller was one of the least popular people as he was seen as taking unfair profit from the fact that the villagers had to use him. In the Lutterell Psalter the miller is typically depicted as an ugly man looming over an old, helpless woman along with a fierce guard dog. “a picturesque agglomeration of buildings, beside the river. The mill-wheel, fed by a stream taken from the Teign some distance up the valley and here returned again to the parent water, thundered on its solemn round in an eternal twinkling twilight of dripping ferns and green mosses; while hard by the dwelling-house stood and offered small diamond panes and one dormer-window to the south. Upon its whitewashed face three fruit-trees grew–a black plum, a cherry, a winter pear; and before the farmhouse stretched a yard sloping to the river ford, where a line of massive stepping-stones for foot-passengers crossed the water“. 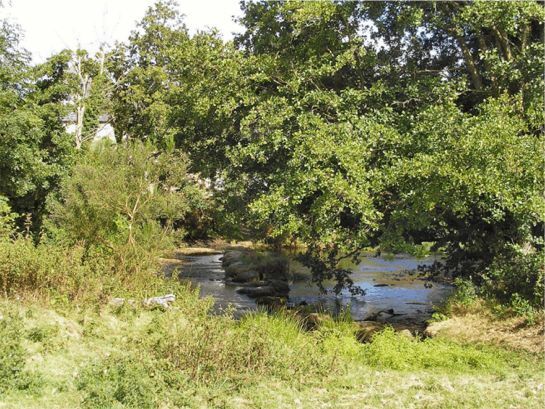 It is interesting to see how the view of the mill across the stepping stones has changed, the photo below was taken in the August of 2006 and the mill is now totally obscured by trees. Its not much of a picnic crossing on the steps either, most of them are covered with moss and a trifle slippy. There was a chapel to the west of Rushford Manor which according to English Heritage records was licensed in 1329, by 1630 it was a ruin and then demolished between the 17th and 18th centuries. (NMR No. SX 78 NW15). Hayter-Haymes, 1981, p.35 further adds that it was a monk called William le Moyne who was given the right to the chapel by Bishop Grandisson. Major Hore finally demolished the structure in the 18th century as in his opinion it obscured the views from his house. The stones were used to rebuild his garden and orchard walls and are evident today. 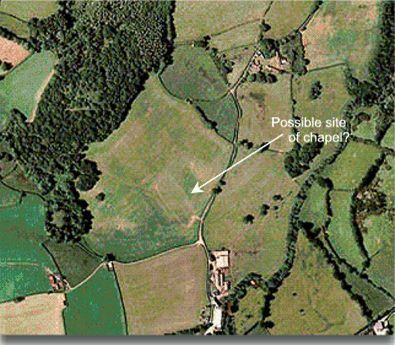 The aerial map below of the area does show the feint outline of a rectangular building near to the site of where the chapel was said to have been, this could well be the last vestiges of the structure? It is thought that the manor pound of Rushford was located somewhere near the farmstead of Mount Flaggon although there is no trace of it today. Rushford bridge was estimated to originally have been 7½ feet wide and was later widened to its present width, much of the original structure including the twin arches were kept, Henderson & Jervoise, 1938, p.40. 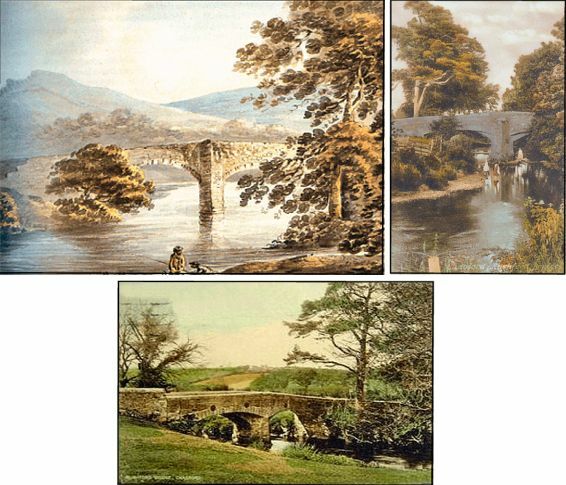 There is an entry in the Chagford’s churchwarden accounts for 1539 for a payment of 10s for repairs to Rushford Bridge. 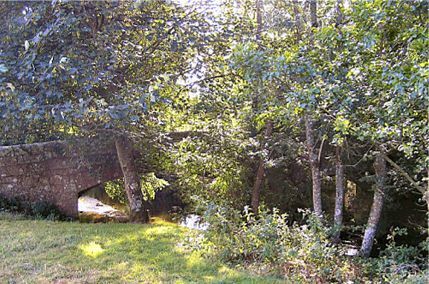 As with much of the area, many of the features have become hidden amongst trees and vegetation, this bridge being no exception. Once again, it is surprising the difference when a comparison is made between the old pictures and the one below taken in 2006. To the southern end of Rushford Wood is what Knowling, 2002, pp. 7 – 8, describes as Dartmoor’s best-known follies. It consists of a single tower and a small castle-like structure, listed as a “small observation tower in the Victorian Gothic style”. Tradition has it that the building was built sometime between 1850 -1900 and that it was used by a ‘grandstand’ for women and children from which they watched the many shooting parties that were held in the woods. J. Ll. Warden Page in his book, ‘The Rivers of Devon, p.74, describes Rushford Tower as an, “modern antique tower”. This book was published in 1893 so perhaps if he describes it as being, “modern”, it could indicate a construction date towards the end of the 1800’s – please note Rushford Tower is on private land with no access rights! Crossing, 1990, p.275, draws attention to a strip of turf that lies to the north of Rushford Tower, this he says was known as the ‘bowling green’ on which was a rock basin known as the ‘punchbowl’. AHE. 2004 Digital Domesday – Devon, CD-Rom, Alecto Historical Editions. Barber, C. 2002 Chagford of Yesteryear, Obelisk Publications, Exeter. Barber, C. 1994 The Great Little Chagford Book, Obelisk Publications, Exeter. Bound, T. 1995 Walks in the Chagford Countryside, Obelisk Publications, Exeter. Cosford, J. & Rhodes, J. 1989 The Chagford Diary, Devon Books, Exeter. Haytor Hames, J. 1981 A History of Chagford, Philimore & Co., London/Chichester. Harris, H. 1992 The Industrial Archaeology of Dartmoor, Peninsula Press, Newton Abbot. Henderson, C. & Jervoise, E. 1938 Old Devon Bridges, Wheaton, Exeter. Hoskins, W. G. & Finberg, H. P. R. 1952 Devonshire Studies, Jonathan Cape, London. Knowling, P. 2002 Dartmoor Follies, Orchard Publications, Newton Abbot. Page, Ll. W. 1893 The Rivers of Devon, Seeley & Co., London. Rice, I. 2002 The Book of Chagford, Halsgrove Publishing, Tiverton. Who lives at the Rushford Barton house today? hahaha “please note Rushford Tower is on private land with no access rights!” I have many memories of exploring up there, and many more memories of running away from angry farmers! My father visited the Rushford Barton house in the mid-1980s and met a Haytor-Hames family member who was still living at the house. He took many photos of the property which I still have today. Many aspects of Norman construction are clearly visible which my Dad thoughtfully documented for me. Our family name pervades some of the Mills in this and surrounding areas before moving further afield with the onset of Railway development. It would be interesting for us to meet up with a local when we are in the area next time?